معصومی, علی اصغر, رحیمی, غلامحسین, لیاقت, غلامحسین. (1396). حل تحلیلی انتقال حرارت ناپایا در استوانه فلز کامپوزیت به کمک تئوری لایه ای و روش حل دیفرانسیل مربعات. علوم و فناوری کامپوزیت, 4(3), 347-358. 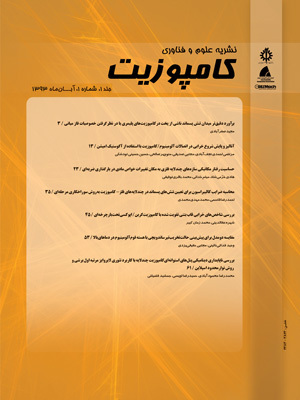 علی اصغر معصومی; غلامحسین رحیمی; غلامحسین لیاقت. "حل تحلیلی انتقال حرارت ناپایا در استوانه فلز کامپوزیت به کمک تئوری لایه ای و روش حل دیفرانسیل مربعات". علوم و فناوری کامپوزیت, 4, 3, 1396, 347-358. معصومی, علی اصغر, رحیمی, غلامحسین, لیاقت, غلامحسین. (1396). 'حل تحلیلی انتقال حرارت ناپایا در استوانه فلز کامپوزیت به کمک تئوری لایه ای و روش حل دیفرانسیل مربعات', علوم و فناوری کامپوزیت, 4(3), pp. 347-358. معصومی, علی اصغر, رحیمی, غلامحسین, لیاقت, غلامحسین. حل تحلیلی انتقال حرارت ناپایا در استوانه فلز کامپوزیت به کمک تئوری لایه ای و روش حل دیفرانسیل مربعات. علوم و فناوری کامپوزیت, 1396; 4(3): 347-358. ر این مقاله حل تحلیلی انتقال حرارت ناپایدار در استوانه فلزی و فلز کامپوزیت به کمک تئوری لایه ای و روش حل دیفرانسیل مربعات بررسی می شود. بدین منظور پنج نمونه از مخزن استوانه ای فلزی و فلز کامپوزیت مورد تحلیل انتقال حرارت ناپایدار قرار گرفته شده است. شرایط حرارتی حاکم بر مسئله از یک شرایط کاربردی و تجربی استخراج شده است. هدف از این تحقیق بررسی رفتار انتقال حرارت در مخازن مذکور می باشد. لذا ابتدا معادلات حاکم بر انتقال حرارت در یک مخزن استوانه ای چند لایه بدست آمده و سپس با توجه به رفتار متفاوت لایه های مختلف در انتقال حرارت جهت بررسی دقیق انتقال حرارت در لایه ها از تئوری لیروایز استفاده خواهد شد. پس از استخراج روابط حاکم بر مسئله با استفاده از تئوری لیروایز این روابط به فرم معادلات ماتریسی مربوط به روش حل دیفرانسیل مربعات نوشته شده و برای حل معادلات بدست آمده به فرم دیفرانسیل مربعات از کد برنامه نویسی متلب استفاده شده است. پس از استخراج نتایج به بحث و بررسی چگونگی تغییرات دما در لایه های مختلف و نحوه رفتار حرارتی در این مخازن پرداخته شده و آنگاه برای صحه گذاری نتایج و مقایسه حل مدلسازی و تحلیل عددی انتقال حرارت یکی از مخازن مورد نظر در نرم افزار المان محدود آباکوس صورت گرفته است. و در انتها روش حل استفاده شده با روش حل دقیق معادلات انتقال حرارت در چند مرجع دیگر مقایسه شده است. In this paper, transient heat transfer analysis in composite metal cylindrical vessel will be investigated using the layerwise theory and differential quadrature method. For this purpose, five samples from the metallic cylindrical vessel and composite metal cylindrical vessel has been under transient heat transfer analysis.Thermal conditions of governing the issue has been extracted from a practical and experimental conditions. The aim of this research is study and investigate the behavior of heat transfer in the vessels mentioned. Therefore, the governing equations of heat transfer is achieved in a multilayered cylindrical vessel. Due to the different behavior of multilayer cylindrical in heat transfer, the analysis is to be done using the layerwise theory in order to obtain more accuracy. Then, the governing equations of heat transfer are derived for this vessel and are solved by differential quadrature method. In differential quadrature method, to solve the governing relations, These equations must be in the form of the matrix equations. The MATLAB programming code to be used to solve this matrix equations. After extracting result, temperature changes and heat transfer behavior in multilayer cylindrical vessel versus time have been discussed. To validate the resulting solution of the layerwise theory and differential quadrature method, modeling and numerical analysis of heat transfer in Abaqus finite element software done and the results of this software were compared with the solution of differential quadrature. Finally, the results of this study have been compared with exact solution of heat transfer equations in the several reference. Wooster, W. A., “A Textbook in Crystal Physics,” First ed., Cambridge University Press, London, pp. 455, 1957. Nye, J. F., “Physical Properties of Crystals,” Second ed., Clarendon Press, London, pp. 309, 1985. Mulholland, G. P., “Diffusion through Laminated Orthotropic Cylinders,” Proceedings of The 5th International Heat Transfer Conference, Tokyo, Japon, pp. 250-254, 1974. Golovchan, V. T. and Artemenko, A. G., “Heat Conduction of Orthogonally Reinforced Composite Material, Journal of Engineering Physics and Thermophysics,” Vol. 51, No. 2, pp. 944-949, 2004. Shi-qiang, D. Jia-chan, L., “Homogenized Equations for Steady Heat Conduction in Composite Materials with Dilutely-Distributed Impurities,” Journal of Applied Mathematics and Mechanics, Vol. 4, No. 2, pp. 167-173, 2005. Greengard, L. Lee, J. Y., “Electrostatics and Heat Conduction in High Contrast Composite Materials,” Journal of Computational Physics, Vol. 211, No. 1, pp. 64-76, 2006. Hassan, N. Thompson, J. E. Batra, R. C. Hulcher, A.B. Song, X. and Loos, A. C., “A Heat Transfer Analysis of the Fiber Placement Composite Manufacturing Process,” Journal of Reinforced Plastics And Composites, Vol. 24, No. 8, pp. 869-888, 2005. Newnham, P. and Abrate, S., “Finite Element Analysis of Heat Transfer in Anisotropic Solids Application to Manufacturing Problems,” Journal of Reinforced Composites and Plastics, Vol. 12, No. 1, pp. 854-864, 1993. Sun, Y. Wichman, I. S., “On Transient Heat Conduction in a One-Dimensional Composite Slab,” International Journal of Heat and Mass Transfer, Vol. 47, No. 6-7, pp. 1555-1559, 2004. Oseloka, O., “Heat Conduction in Composite Media: A Boundary Integral Approach” Journal of Computers & Chemical Engineering, Vol. 26, No. 1, pp. 1621-1632, 2002. Lu, X. Tervola, P. and Viljanen, M., “Transient Analytical Solution to Heat Conduction in Composite Circular Cylinder” International Journal of Heat and Mass Transfer, Vol. 49, pp. 348-341, 2006. Lu, X., Tervola, P. and Viljanen, M., “Transient Analytical Solution to Heat Conduction in Multi-Dimensional Composite Cylinder Slab” International Journal of Heat and Mass Transfer, Vol. 49, pp. 1107-1114, 2006. Bahadur, R. and Bar-Cohen, A., “Orthotropic Thermal Conductivity Effect on Cylindrical Pin Fin Heat Transfer” International Journal of Heat and Mass Transfer, Vol. 50, No. 2, pp. 1155-1162, 2007. Kayhani, M. H. Norouzi, A. Amiri Delouei, A., “A General Analytical Solution for Heat Conduction in Cylindrical Multilayer Composite Laminates” International Journal of Thermal Science, Vol. 52, No. 1, pp. 73-82, 2012. Amiri Delouei, A. Kayhani, M. H. Norouzi, M., “Exact Analytical Solution of Unsteady Axi-symmetric Conductive Heat Transfer in Orthotropic Cylindrical Composite Laminates” International Journal of Heat and Mass Transfer, Vol. 55, No. 15, pp. 4427-4436, 2012. Mohapatra, R. C. Mishrab, A. Choudhuryc, B. B., “Determination of Thermal Conductivity of Pine Wood Dust Filled Epoxy Composites” Thermal Scince, OnLine-First, 2016. Ozisik, M. N., “Heat Conduction” Second ed., Wiley, New York, 1993. Barbero, E. J. Reddy, J. N., “Modeling of Delamination in Composite Laminates Using a Layer-Wise Plate Theory” International Journal of Solids and Structures, Vol. 28, No. 3, pp. 373-388, 1991. Reddy, J. N., “Mechanics of Laminated Composite Plates and Shells Theory and Analysis” Second ed., CRC PRESS, New York, 2003. Noack, J. Rolfes, R. Tessmer, J., “New Layerwise Theories and Finite Elements for Efficient Thermal Analysis of Hybrid Structures” Composite and Structures, Vol. 81, No. 3, pp. 2525-2538, 2003. Nosier, A. Kapania, R. K. and Reddy, J. N., “Free Vibration Analysis of Laminated Plates Using a Layerwise Theory” The American Institute of Aeronautics and Astronautics Journals, Vol. 31, No. 12, pp. 2335—2346, 1993. Reddy, J. N., “Energy Principles and Variational Methods in Applied Mechanics” Second ed., .John Wiley, New York, 2002. Oden, J. T. and Reddy, J. N., “Variational Methods in Theoretical Mechanics” Second Edition, Springer- Verlag, Berlin, 1982. Lanczos, C., “The Variational Principles of Mechanics” The University of Toronto Press, Toronto, 1964. Shu, C., “Differential Quadrature and Its Application in Engineering” London, Springer-Verlag, pp. 10-150, 2000. Bert, C. W., and Malik, M., “Differential Quadrature Method in Computational Mechanics: a review” Applied Mechanic Review, Vol. 49, No. 1, pp. 1-28, 1996. AISI Alloy , http://www.azom.com/article.aspx, available in 20, March 2016.
 http://www.memsnet.org/material/, available in 20, March 2016. Touloukian, Y. S. Ho, C. Y., “Thermophysical Properties of Matter, Plenumpress” New York, pp. 740, 1972. All the Materials you need for Scientific and Industrial Research and Manufacturing, http://www.goodfellow.com/E/Carbon-EpoxyComposite-Tube.html. available in 20, March 2016. Johnson, R. R. Kural, M. H. Mackey, G. B., “Thermal expansion properties of composite materials” NASA Contractor Report 165632, 1981. Wei, W. Rongjin, H. Chuanjun, H. Zhao, Y. Li, S. Laifeng, L., “Cryogenic Performances of T700 and T800 Carbon Fibre–Epoxy Laminates” Proceedings of the School of Materials Science and Engineering, Tianjin University, China, 2015. Nelson, C. W. Ward, J. R., “Calcculation of Heat Tranfer to The Gun Barrel Wall” Ballistic Research Laboratory Aberdeen Proving Ground, Maryland, March 1981. Ian, J., “Understanding and Predicting Gun Barrel Erosion” Weapons Systems Division, August, 2005. Qu, P. Qiang, L. Zhen Y., “Thermal Analyses of Midwall Cooling Gun Tubes Based on Liquid-solid Coupled Method” Journal of Information & Computational Science, Vol. 11, No. 9, pp. 3241–3250, 2014. Qu, P. Qiang, Li. Shufang, Yang., “Thermal Analyses and Experimental Validation of External Cooling Method for a Gun Barrel” Journal of Information & Computational Science Vol. 11, No. 13, pp. 4759-4767, 2014. Mikhail, M. D. Ozisiki, M. N. Vulchakov, N. L., “Diffusion in Composite Layers with Automatic Solution of the Eigenvalue Problem” International Journal of Heat and Mass Transfer. Vol. 26, No.8, pp. 1131-1141, 1983. Johnston, P. R., “Diffusion in Composite Media: Solution with Simple Eigenvalues and Eigenfunctions” Mathl. Comput. Modelling Vol. 15, No. 10, pp. 115-123, 1991.